Yummy! Raise your hands for those don’t like this. Not me. Rendang is a Malay dish and can be done using beef or chicken. Beef rendang taste best with a sweet end. But not the chicken version. I did not add in any sugar, but the taste is pretty balanced. Although the ingredients are almost the same, the outcome is different. 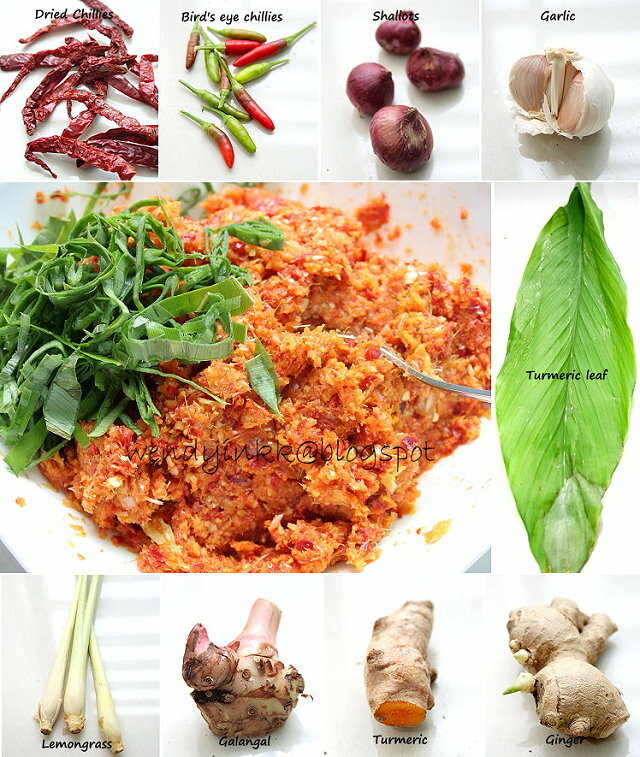 The ingredients used are very basic ingredients in Malay cuisine, but the taste is fabulous. Coconutty and aromatic. Every bit of the fragrant paste(so thick, it can’t be called gravy) is smothered over rice and eaten, delicious! My 2 cents, cook it until it releases oil, if not it won’t taste good. Use a heavy based pot to minimize the risk of burning the dish. It’s simple, just blend and simmer. This is my first time cooking chicken rendang, but I think I’ll cook this dish quite often as it’s my FIL’s fav and it’s so simple, plus I can cook extra for 2 meals. Overnight rendang taste fabulous! Although my hubby prefers the beef version, he definitely won’t complain if I cook this. *If you have problem grinding in the mill with these ingredients and would prefer using the blender, blend them together with the coconut milk and water. It works the same. But I do not want to stain my blender ‘yellow’ with turmeric. Staining one apparatus is enough for me. 1. Cut whole bird of chicken into 12 pieces. 2. 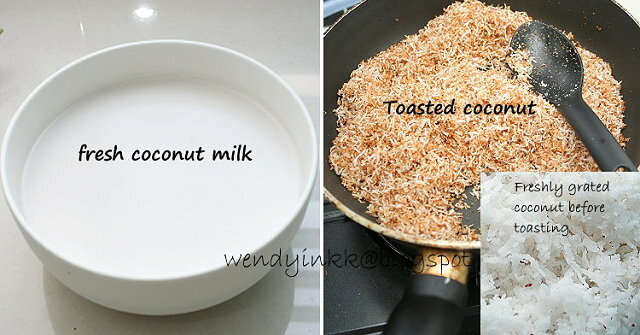 Combine all ingredients except freshly grated coconut. Bring to a boil and lower to medium low heat and simmer for 30 minutes, lid on. 3. Meanwhile, toast coconut until dry, fragrant and golden. 4. After 30 minutes of simmering, put toasted coconut into the pot and bring heat to medium and reduce gravy. Lid should be off at this time. 5. Reduce gravy until almost no liquid is visible, but oil is at the base. The aromatics should still be moist. The chicken rendang was served with nasi lemak Joonah style. Joonah is the shop where they serve our favourite beef rendang. I had some 'paste' left unconsumed and I used it make pulut panggang. This must the REAL delicious! Thumbs up to you for not wasting any left over paste. 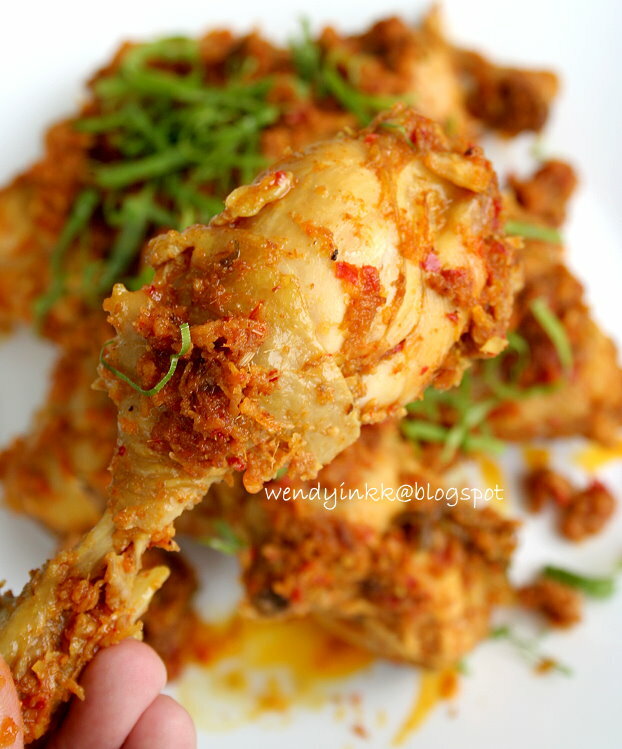 Your chicken rendang look so delicious. So nice, the leftover paste can use to cook other dishes. 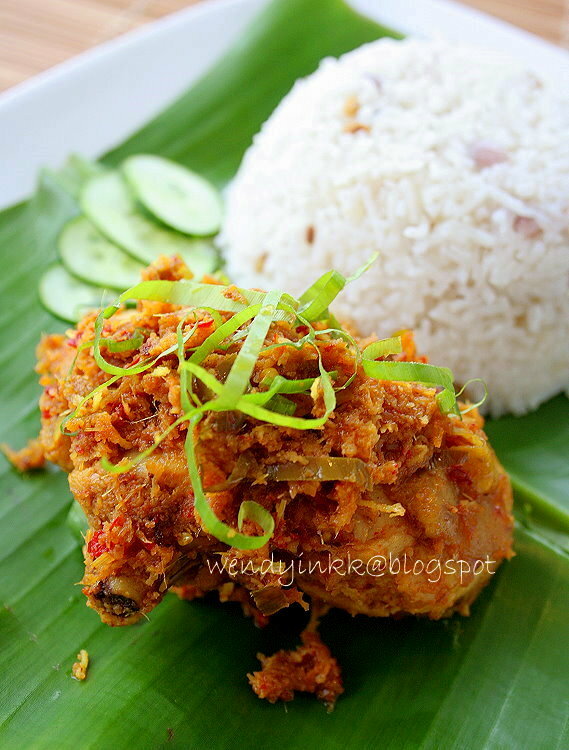 Ayam rendang is my favourite, feel so hungry when read your blog..drooling liao..hehe... Thanks for sharing ya..
so rajin la you ...belum raya lg dah buat rendang gitu...hehehe. If i want to cook pork rendang - which part of pork should i use ? Is the cooking method the same? YUMMO! i am going to try this VERY soon. Thanks! Good thing you pointed out the turmeric staining part, else i would have jutmblindly chuck it in and then smack my self for staining the mill. ;p if i substitute with turmeric powder, how much would i need? This will surely perk me up ! Rendang ! yummy...drooling now ! Wah, yummylicious... I love your blog and u did a fabulous job. Very clear picture and especially the raw ingredient that shows. Sometime, I get confuse n no idea how the ingredient looks.. The pic clear my doubt :) well done Wendy!!! Bravo!!! 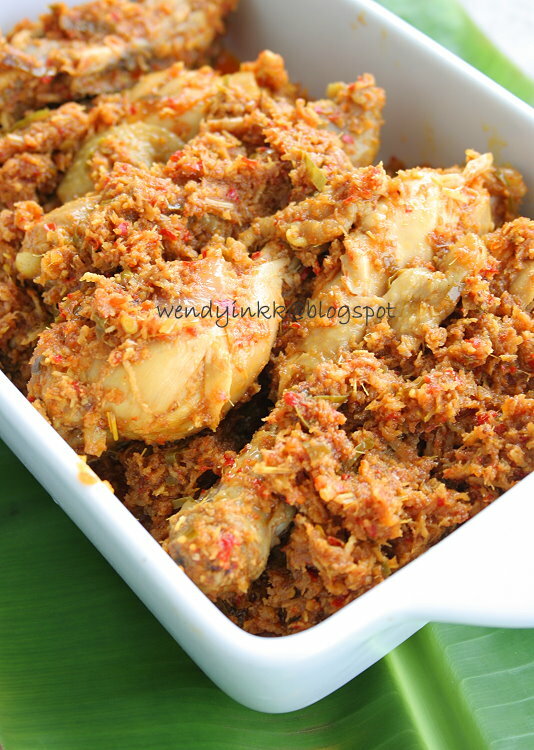 Woa the rendang chicken looks so delicious, so tempted to try it especially you have provided the images of all spices which I am bad with lol. 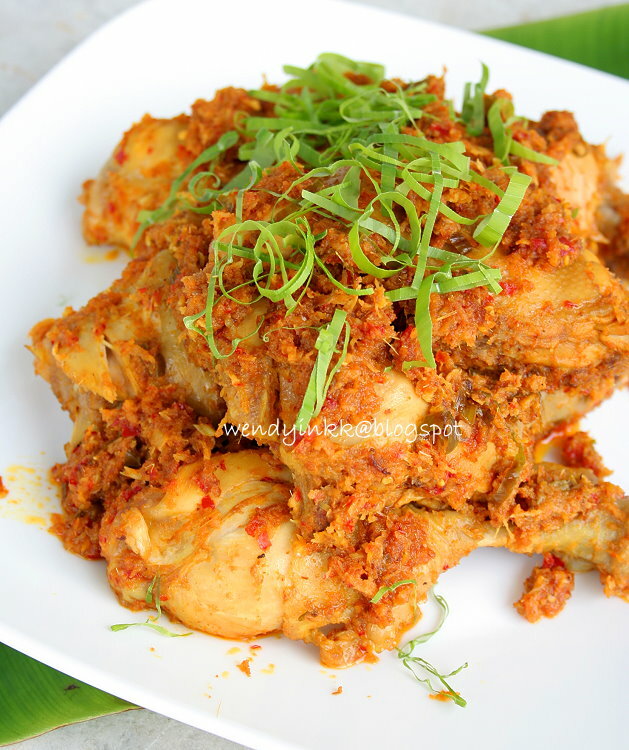 Delicious chicken rendang. 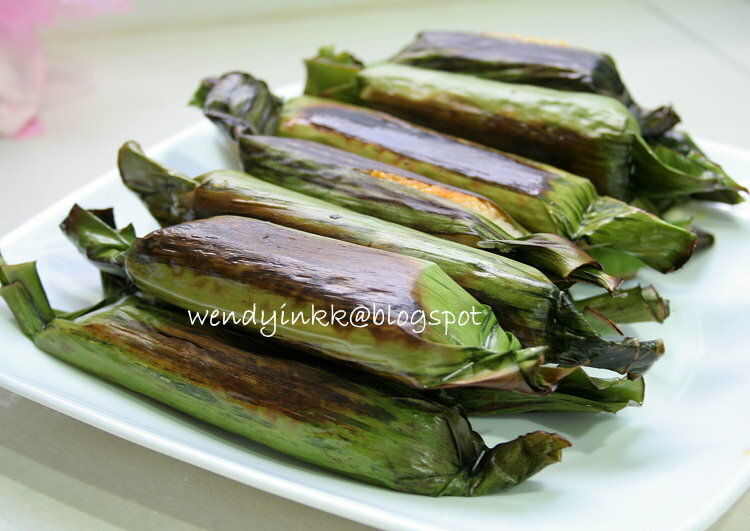 And loved your pulut panggang, miss them so much. And salivating now. very sayang de lor, cannot discard just like that. Easy right? NCL will want to eat lor, u have no excuse. Ni dah buat berkurun dahulu, skang tiba masanya nak bagi dia timbul jumpa sang suria. almost the same, refer to my beef rendang post. But I do find the flavour to be inferior to fresh turmeric. Just stain one apparatus only la. for me, my mill is all scarred from spices milling and yellow with turmeric. Pathetic mill, LOL! U've been sleeping at work ah? It's hard to get the ingredients there now during winter right? Blend some onions to remove the sappy kunyit stains on your blender blades. Other parts that are stained yellow can be removed by direct strong sun, including chopping boards and dish cloths. The stains are on the plastic cup, not the blades. I blend onions often, but it never comes off, only after a long long time that I never used turmeric again. Yeah I heard it's hard in Singapore. I rarely use paste as I can't get the taste I want. Still have to fix the paste, ahh, might as well do it from scratch. 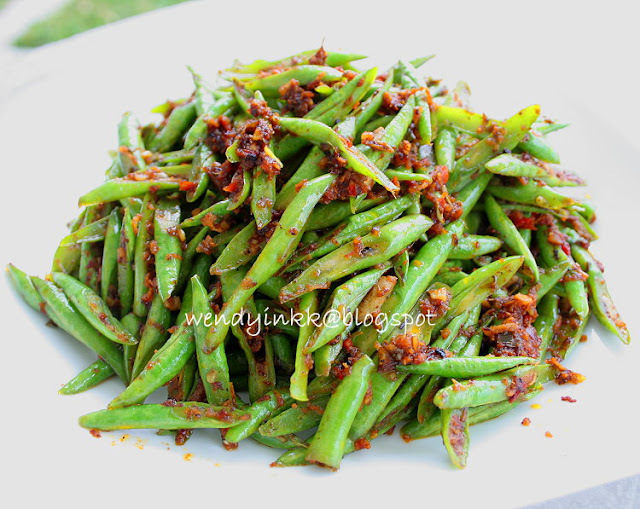 Would like to try this soon... Any substitute for turmeric leaves? Can't get it here... Thanks. I LOVE RENDANG. FULL STOP. looks sooo good! this kind of dishes very dangerous to us..can gain a kilo next day..haha! a little correction. Rendang is not Malay dish. Its Indonesian dish, particularly Padang, West Sumatra. The Malay I am refering here is the race, not a nationality. In Malaysia the Minangs, Padangs, or even Javanese are considered Malays. There's no other boxes for them to tick. And yes, these ethnic Malay groups do originate from Indonesia. Sometimes, it's easy for us to call our dishes as Chinese food whereas it doesn't even exist in China. Maybe it's because the name of the country of our ancestors did not differ with the race tag we have been placed with here. You can plant the unused turmeric in 6 inch pots and they will give you leaves in the future. No need to buy. Don't worry, they don't take much space, the next time u need more turmeric, just dig out and plant back the unused portion. Wendy, how much of the paste did you add into your rendang? I put all, but after eating the chicken, there was a lot of remnants left, that is the 'paste', with the '', heheheh. Just looking at the photo makes me feels so hungry!!! Thanks for such a lovely and yummy recipe! Yours will be my only chicken rendang recipe whenever I cook. Thank you dear.